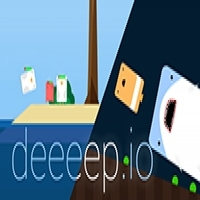 Game directions: In the underwater world of Deep your main objective is survival, starting off it can be kind of rough since the people already in the server have began their ascent up the food chain, but fear not as there is plenty of food to go around for newbies too! As you consume food you will fill your xp bar at the bottom of the screen, once it is fill your character will instantly change into a new creature, usually having different traits. It is important to keep an eye on your oxygen meter too as some of the animals can not breath under water infinite such as the seagull, however they can fly above the water in place of this. An important thing to take into account when playing Deeeep.io is that anything bigger than you can eat you apart from players of the same species, this rule does not apply to sharks though. Controls The controls are very basic, you use the mouse to navigate and use space bar to boost forward a limited amount, this can be useful for closing the gap between you and an enemy or allow you to catch up to your prey.